The temple is framed by huge corridors into which Jahamun Gate, Daeungjeon Hall, and Museoljeon Hall are built. The transepts at the east and west of Daeungjeon Hall connect to the east and west corridors. Jwagyeongnu Pavilion is located in the eastern corner of the south corridor, while Beomyeongnu Pavilion sits in its western corner. Cheongungyo and Baegungyo Bridges, both of which lead to Daeungjeon Hall, are situated to the south of Jahamun Gate. History and Architectural Characteristics: History - References to Bulguksa Temple appear in a number of important ancient documents including Samguk yusa (Memorabilia of the Three Kingdoms), Bulguksa gogeumchanggi (Records of Bulguksa Temple), and Daeungjeon jungchangdanhwakgi (Records of Construction and Repair Works of Daeungjeon Hall) among others. According to Samguk yusa, construction of the temple was begun in 751, the tenth year of the reign of King Gyeongdeok of the Silla Dynasty, by Prime Minister Kim Daeseong and completed on December 2, 774 (the 10th year of the reign of King Hyegong), shortly after Kim’s death. According to Bulguksa gogeumchanggi, Daeungjeon Hall was repaired in 1436 (the 18th year of the reign of King Sejong of the Joseon Dynasty), in 1490 (the 21st year of the reign of King Seongjong), and again in 1564 (the 19th year of the reign of King Myeongjong). However, the building was burned to the ground in 1593 (the 26th year of the reign of King Seonjo) during the Japanese Invasion of Korea. Thereafter, various restoration works were conducted over a period of many years – including reconstruction in 1659 (the 10th year of the reign of King Hyojong), roof repair work in 1677 and replacement of the western column in 1708 (the 3rd and 34th years of the reign of King Sukjong), and roof repair works in 1729, 1730, and 1731 (the 5th ~ 7th years of the reign of King Yeongjo). The hall was reconstructed in 1765 (the 41st year of the reign of King Yeongjo), while the paintwork was completed in 1767 (the 43rd year of King Yeongjo’s reign). 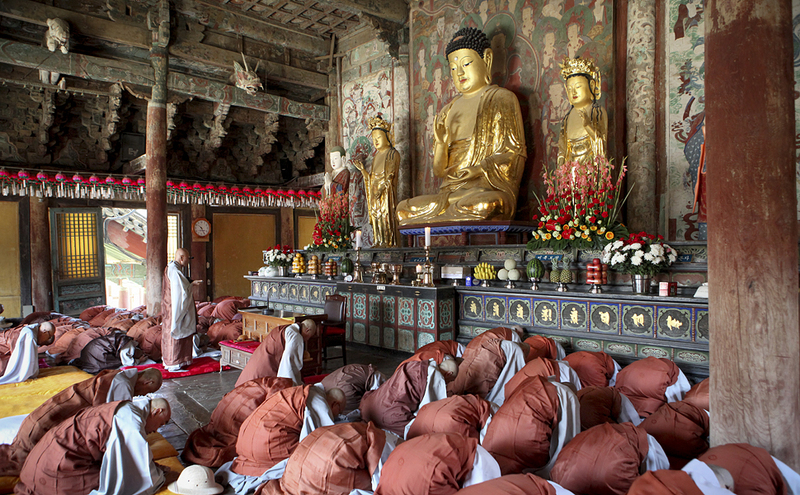 In addition, the production of the Buddha Triad and the Buddhist Painting work at Daeungjeon Hall were completed in 1769 (the 45th year of King Yeongjo’s reign). One and a half centuries later, during the Japanese occupation, the hall was restored by the Japanese Government-General of Korea between 1918 and 1925, and further renovation work was conducted between 1934 and 1935. In the 1970s, the building was reconstructed yet again at the order of former president Park Chung-hee. 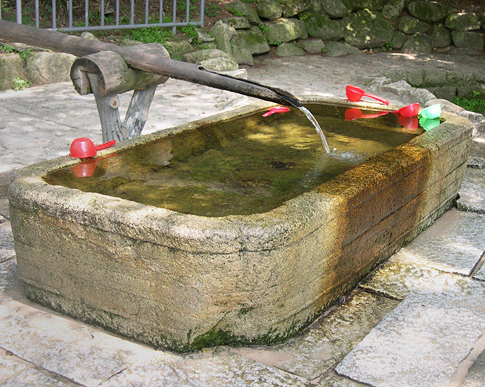 This rectangular stone basin on the grounds of Bulguksa Temple was made during the Unified Silla Period (676-935). It notably differs in style from the stone basins of Baekje (18 B.C. - A.D. 660), which are mostly circular. It has carvings both on the inside and outside, and the rim is uniquely rounded at the corners. The gorgeous lotus design carved on the bottom shows the high standard of Buddhist art during the Unified Silla Period. The basin has outstanding historic and cultural value. The stone elevation was harmoniously built according to the topography of the temple, which is characterized by low west and south, and high east and north. The temple is framed by corridors into which Jahamun Gate, Daeungjeon Hall, and Museoljeon Hall are built. The transepts to the east and west of Daeungjeon Hall connect to the east and west corridors. Jwagyeongnu Pavilion is located in the eastern corner of the south corridor, while Beomyeongnu Pavilion sits in its western corner. Cheongungyo and Baegungyo Bridges, both of which lead to Daeungjeon Hall, are situated in south of Jahamun Gate. Geungnakjeon Hall (Hall of Paradise), which is surrounded by large corridors, is situated west of Daeungjeon Hall at Bulguksa Temple. The hall can be reached via Yeonghwagyo and Chilbogyo Bridges and by Anyangmun Gate. The stone elevation situated to the northeast of Geungnakjeon Hall and consisting of three rows of sixteen steps, which represent the forty-eight vows of Amitabha, leads to Daeungjeon Hall. History and Architectural Characteristics: History - According to Samguk yusa, construction of the temple was begun in 751, the tenth year of the reign of King Gyeongdeok of the Silla Dynasty, by Prime Minister Kim Daeseong and completed on December 2, 774 (the 10th year of the reign of King Hyegong), shortly after Kim’s death. The temple underwent nine series of reconstruction and restoration work between the mid-8th century in the United Silla Period and the Japanese Invasion of Korea during the Joseon Period. During the Japanese Invasion of Korea, all the temple’s wooden buildings were burned to the ground, leaving only its only stone structures – including the stone elevation, Yeonghwagyo and Chilbogyo Bridges, Cheongungyo and Baegungyo Bridges, two stone pagodas, stone lantern, stupa, flagpole supports, other stone stereobates and building foundations – intact. Centuries later, the stone elevation and other stone structures were repaired in 1923, during the Japanese occupation, while excavation, investigation and restoration works were conducted in 1969. The stone elevation was rebuilt in 1970. Construction : The beautifully constructed Cheongungyo and Baegungyo Bridges are situated in front of Jahamun Gate, before which a now buried pond (gupum yeonji) was one located. The land on which Geungnakjeon Hall is located is lower than the site of Daeungjeon Hall. Yeonghwagyo and Chilbogyo Bridges are situated in front of Anyangmun Gate, which stands in front of Geungnakjeon Hall. The corridors leading to Anyangmun Gate encompass Geungnakjeon Hall, whose eastern corridor connects to the corridor of Daeungjeon Hall. 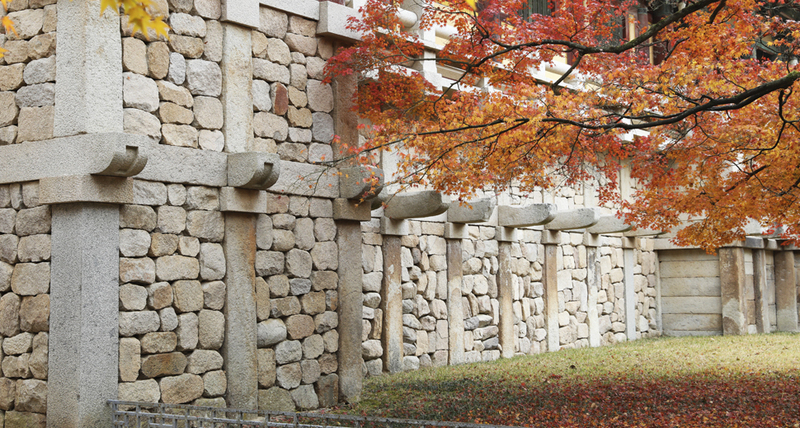 The perfectly composed stone elevations stand in front of Anyangmun Gate and Jahamun Gate. The east stone elevation in front of Jahamun Gate was built by changing the structure of its upper tier on the staircase of Baegungyo Bridge, while the west stone elevation in front of Anyangmun Gate was built by erecting well-trimmed stone pillars with long supporting stones, in between which natural stones were fitted. The stone elevation in front of Jahamun Gate and Beomyeongnu Pavilion was built using huge natural stones for the lower tier, and with processed stones for the upper tier. Stone pillars were erected under the projecting part of the columns of Beomyeongnu Pavilion, while the stone bridge was built with a sophisticated style of rainbow-shaped arch. Stone elevations were also built under the west corridor around Daeungjeon and Geungnakjeon Halls. As regards the stone elevations, rectangular grid frames, in which natural stones were compactly fitted together, were erected with vertical stone pillars and horizontal juduseok (cheomchaseok) stone and short stone pillars, cornerstones, and flat stones. Daeungjeon Hall has a single-tiered stone elevation, while Geungnakjeon Hall has a two-tiered one. 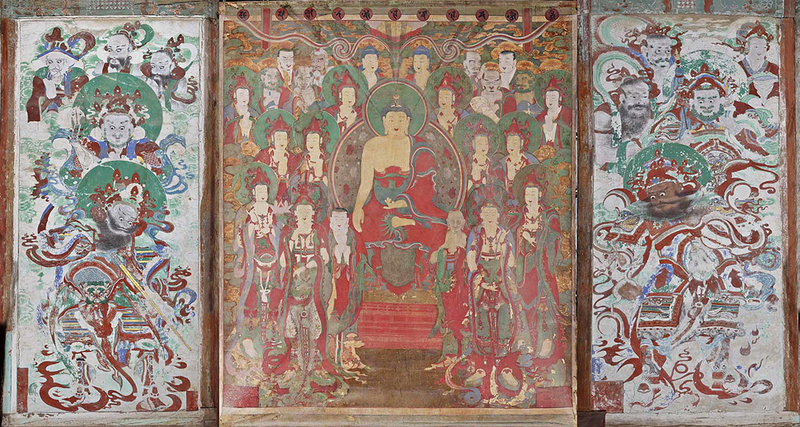 The Buddhist Paintings of Bulguksa Temple in Gyeongju were produced in 1769 with the aid of a donation from Princess Hwawan, a daughter of King Yeongjo, and a court lady named Kim. 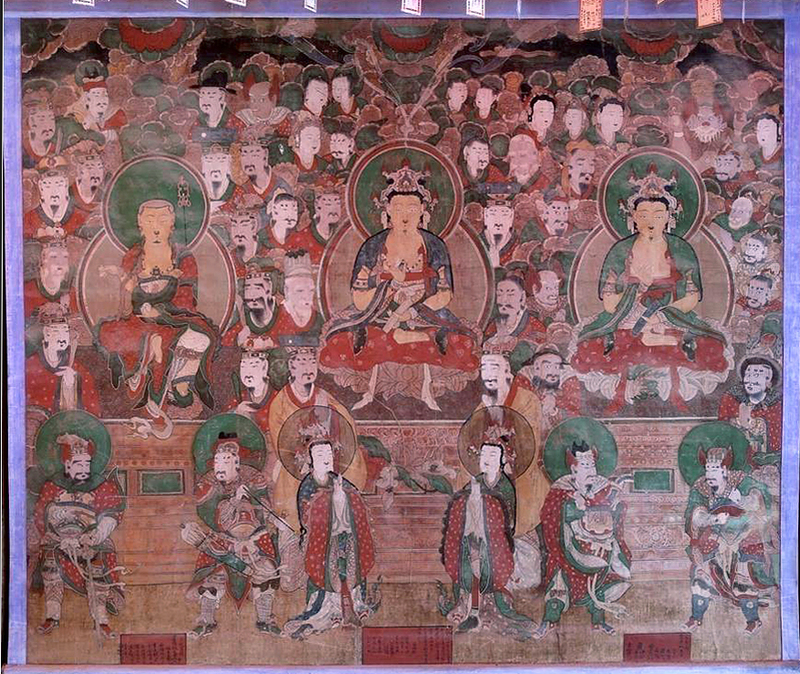 The paintings include one Buddhist painting describing the Vulture Peak Assembly and two mural paintings about the Four Guardian Kings. The painting of the Vulture Peak Assembly is marked with the number 1769, the year in which it was painted, while the mural paintings of the Four Guardian Kings only show the names of the painters. However, it is assumed that these paintings were all made together in the same year, because the monk painters who did the painting of the Vulture Peak Assembly also participated in the creation of the mural paintings, and because all three paintings show similar characteristics in the expression of figures and coloring. The painting of the Vulture Peak Assembly was made by monk painters who stayed at several temples, including Tongdosa and Bongjeongsa, in the Gyeongsang-do area during the mid- and late 18th century. The paintings display the representative painting styles of the Gyeongsang-do area, such as the splendid yet calm colors and well-balanced composition. In addition, these paintings show an interesting side as Buddhist paintings of the late Joseon Period, as they constitute a rare, unique example of a set of Buddhist paintings that includes both a hanging painting and a mural painting. Two stone banner pillars called "Dangganjiju"in Korean are "among those that tourists may easily overlook. These pillars are located in the front yard of Chilbogyo and Yeonhwagyo. These pillars originally served stones to which a banner is hung on a pole. In the ancient times, this banner served as a microphone to news and events at the temple. These stone pillars are known to have been dated from the Unified Silla Period (AD 668–935), but they have not been designated as one of the cultural asset ratings such as national treasure or important folklore materials by the Korean government because the pairs do not match with each other.